Do you like bread? Who doesn’t. There’s nothing like the sound of perfect crust crackling, or the aroma emanating from the soft center. When you’re holding bread, GOOD bread, you observe, listen, smell, touch, and finally taste. When it’s done well, you know it. I’m not talking about that stuff which can probably survive a nuclear war, natural disaster, or can live on the shelf from one Olympics to the next without going bad. 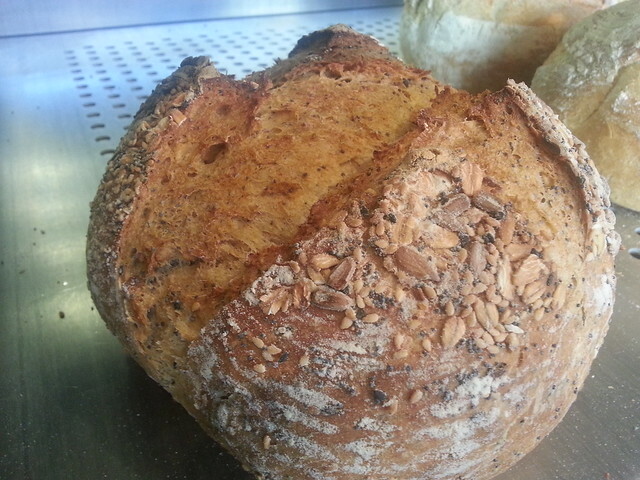 The good bread I speak of is from those who make it from scratch, and know bread better than anyone. Enter Hof Kelsten. My affinity for bread goes back a few years ago when I was working at Cavallaro on Sherbrooke St. West, particularly when I would open the store on Sunday mornings. As I approached the store at about 7:30am the smell of fresh baked bread, croissants, and danishes filled the air from about half a block away. Carefully placing the warm loaves on the wooden display rack, the baked-goods on the sheets of parchment, and the rolls in baskets was all part of the morning routine. One of my fondest memories was opening a hot croissant and spreading dulce de leche inside while sipping back on a latte. It was my favorite thing to really wake up to. A few years later, I started working for a great little catering company called Cinq a Chef (I still work there by the way). One night, the head chef and owner, Kris Laing, brought one of his buddies to help. This very tall chef worked at Noma, French Laundry, Per Se, and El Bulli to name a few. I was introduced to Jeff Finkelstein, or Fink, at that party. We worked a few jobs together over the next while, but it wasn’t until Chef Kris’ wedding where I really found out where Fink’s real passion lies. I was part of a small team that helped cater the party, where the kitchen was lead by Finkelstein. 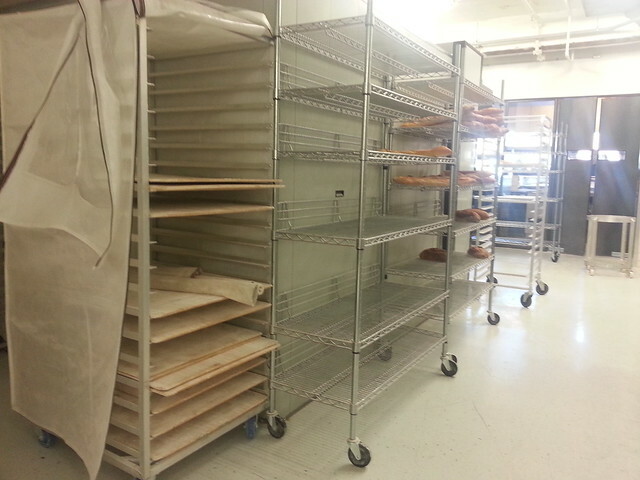 Guests were arriving at 5:00ish, and at 3pm the bread went into the ovens. 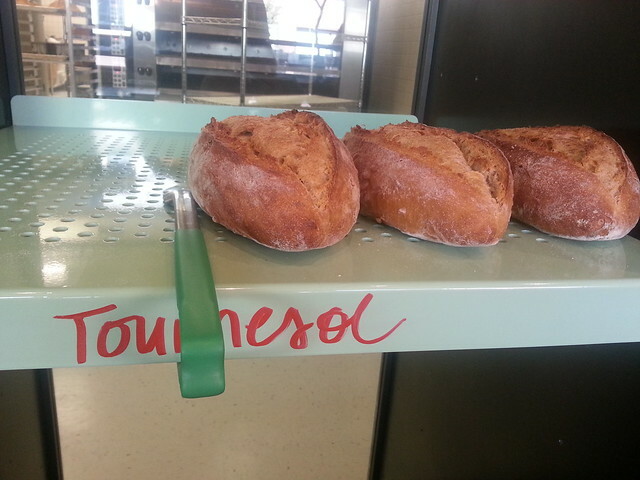 Yes, all the bread was baked 2 hours before guests arrived so they can taste it fresh. That’s not normal, I thought to myself. The bread is usually the part of a meal that’s given the least attention, usually because it’s done before hand. Hors d’oeuvres, salad, soup, mains, sides, and even the odd vegetarian request clearly takes precedence. Not this time. Not when Fink is in charge. I experienced dedication, respect for the ingredients, and sound technique in just a few moments. Chances are you’ve eaten bread from Hof Kelsten without even knowing it. 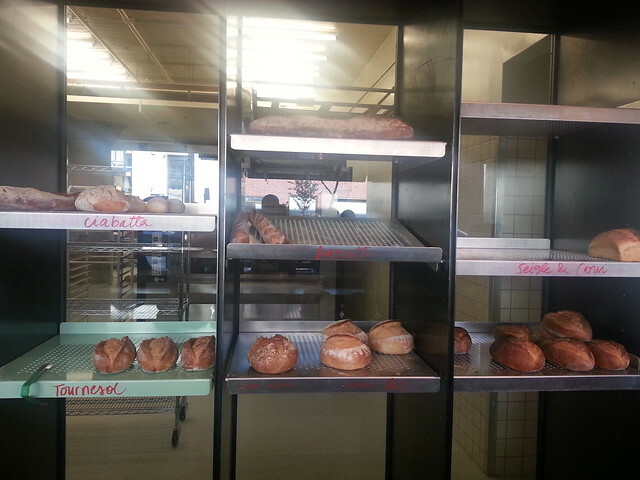 For the last few years, Finkelstein has been operating his private bakery in the plateau and selling his precious loaves to the best restaurants in the city. Notable customers include Joe Beef, Toqué!, Club Chasse et Pêche, Le Filet, Nora Gray, Dominion Square Taverne, Lemeac, again, to name a few. Needless to say, his bread is kind of a big deal. So, finally, Hof Kelsten opened to the public in a location big enough to fulfill the orders of Montreal’s most beloved restaurants, while also being able to offer individual customers a loaf. After a few visits to Hof Kelsten, I realized there’s more than just bread, although it certainly is the focal point of everything on the menu. Walking into what formerly was a Super Club Videotron, Hof Kelsten is located on Saint-Laurent, just a couple doors north of Mont Royal. The unfinished woodsy appearance is part of the charm while a green fluorescent light showcases the name of this heavenly place. As soon as I walked in, I was taken back to my bakery days. That smell! I was lucky enough to get a little tour of the place. In the back is probably the biggest oven anyone has ever seen. “It can bake 100 baguettes at once” explained Finkelstein as he showed off his baby, a Bongard oven with a conveyor belt to gently place the bread on the deck, which also shifts between each of the four levels with a little elbow grease. It’s top of the line stuff here. No cutting corners, at Hof Kelsten. The water filtration and distribution system is also no joke. Instead of being measured in litres, gallons, or whatever unit of volume, the system automatically delivers water in weight and at the ideal temperature. This may sound like mumbo-jumbo, but trust me the proof is in the end result. The bread is the center of attention on their menu. 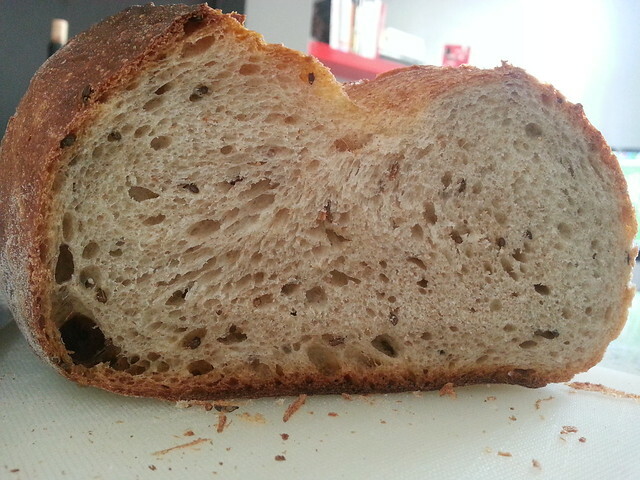 I’m a big fan of the sourdough and rye with kimmel (caraway) seeds. 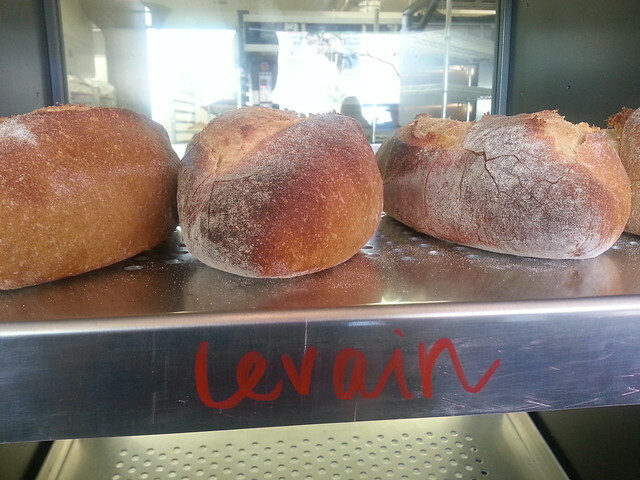 The baguette, ciabatta, and sunflower seed bread look fantastic too. Their featured sandwiches include brisket (poitrine do boeuf), chopped liver, chicken salad, grilled cheese with egg, and gravlax. I sense some Jewish influence here, and I like it! Don’t look past the matzoh ball soup, borsht, or potato salad. All this can be enjoyed with a really good coffee. My first visit came just a week into their official opening. I couldn’t resist. I devoured the brisket sandwich and potato salad. The brisket is very unique. 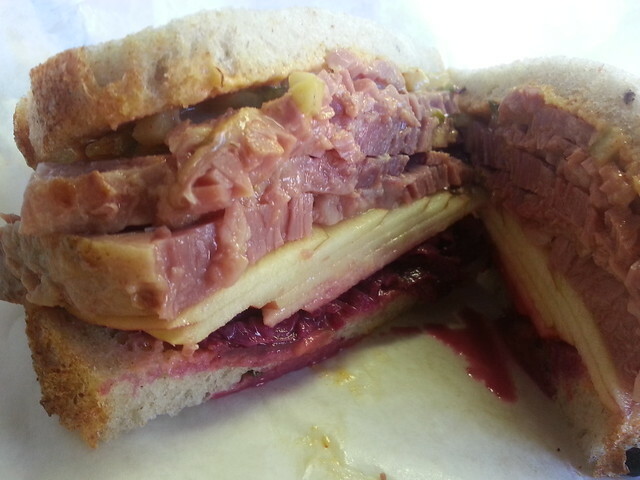 It’s pickled initially and served warm with thin slices of apple, coleslaw made with red cabbage and beets, and a house-made thousand island dressing, on rye. This is a take on Fink’s mom’s recipe, so it has to be good, and boy was it ever. Mrs. Finkelstein, your brisket is delicious! The warm and moist brisket is really taken to the next level with the sweet apples and coleslaw. 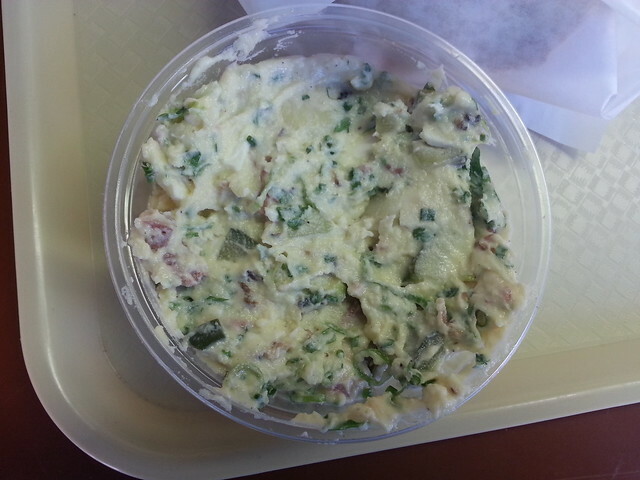 To accompany it, I also noshed on the potato salad. The soft potatoes are mixed with pickles, chives, bits of brisket, and some hard boiled egg. Nice! On my second visit, I tried both the gravlax and a strawberry-walnut danish. 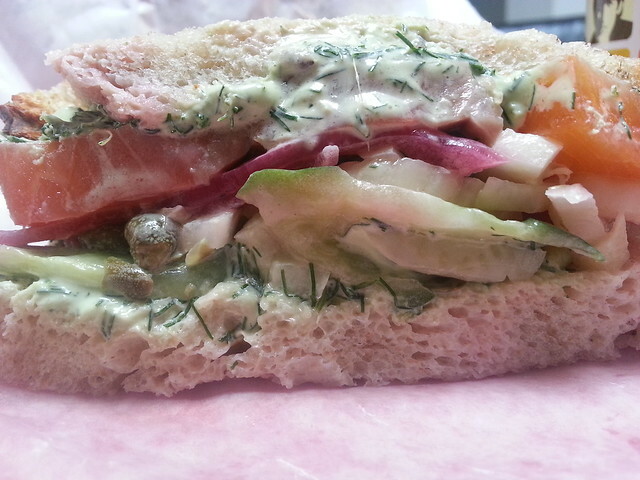 The thick-cut salmon gravlax pieces are accompanied by slices of fennel, dill mayonnaise, cucumber, and capers, served between two slices of rye with kimmel (caraway) seeds. Every bite is heavenly. The thick, sultry pieces of salmon are perfect, while the capers add a nice salty bite, the cucumbers freshen it up, and the dill dressing adds a great herbaceous note. I also snacked on the strawberry and walnut danish which I can tell just came out of the oven. 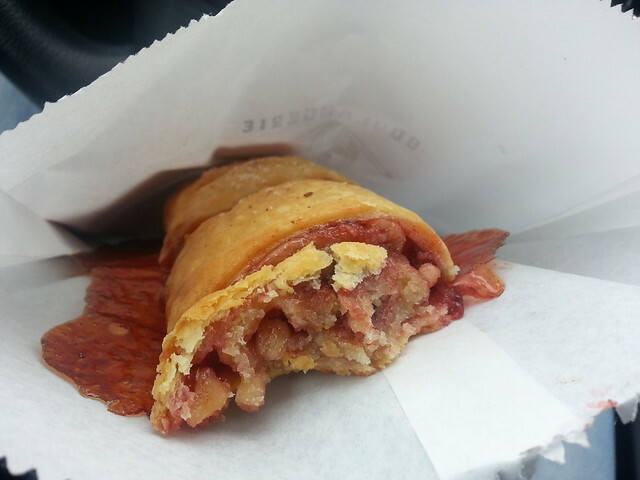 Honestly, it’s one of the best danishes I’ve ever had. What I loved the most about it, and pay attention other bakeries who make danishes, is the sugary “skirt”, which oozes out from all sides when it’s baked, is still attached when served (I used to break off and snack on those parts when I put the danishes out at Cavallaro). Unreal. What should you know now: their challah bread is flying off the shelves. They only bake it on Fridays, so if you want one, and you should, reserve on in advance by emailing info@hofkelsten.com. Also, keep on eye out for more Jewish-style deli meats and baked goods such as lox, and rugalach. Oh, and the matzah ball soup…off the charts amazing. There’s a lot of hype around Hof Kelsten, and it doesn’t disappoint. On a personal note, I couldn’t be happier for the humble Chef Fink. Even though he’s cooked in the best restaurants in the world, his passion for bread, his roots, Montreal, and an appreciation for sound technique are clearly displayed in every crumb. 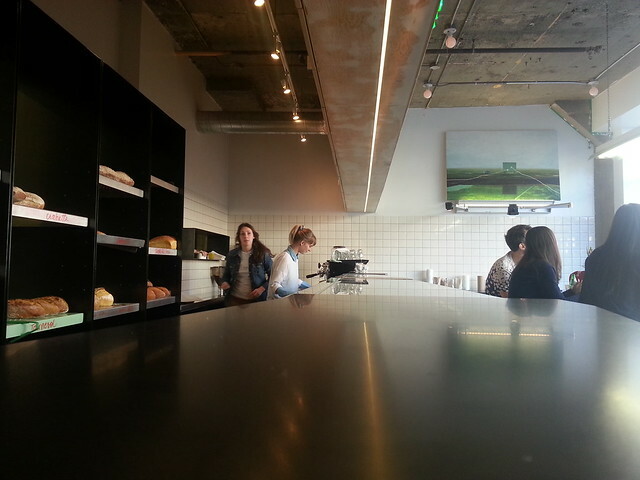 The bread is phenomenal, the food is fantastic, and I really love hanging out there. 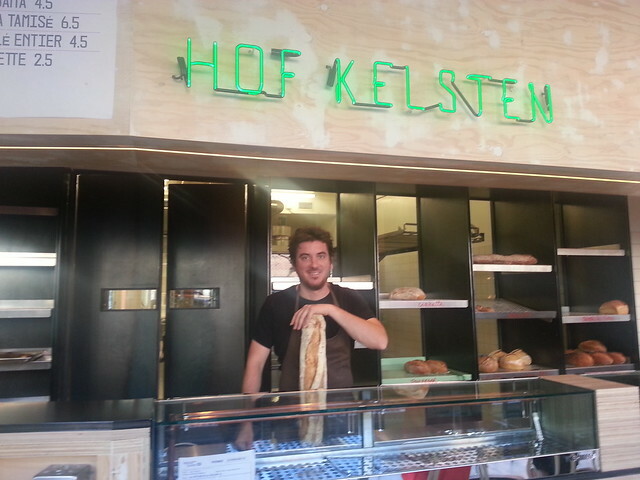 Bread-lovers, make your way to Hof Kelsten. Thanks for doing the in-depth research for us all. I am SO going there and eating/ buying next time I am in MTL.